The Nieros hand wash station is developed with years’ worth of expertize and experience. All our hand wash stations are made to optimize your working processes and ensure the highest levels of productivity for your company. The health and safety of workers can not be compromised, while our hand wash stations allow for optimum hygiene at the workplace, ensuring safety of your products. Understanding the industry regulations and demands, we insist that personal hygiene at the workplace starts with the hands, making a passage through the hand wash stations obligatory and smooth. In the food-making and food-processing industries, microorganisms have the most favourable conditions for growth and reproduction. Therefore, it is very important for companies and employees in these areas to develop an understanding of what a highly sensitive field of activity they are working on and to really make hand wash stations an integral part of the production process. In addition to hand washing, rules on protective clothing and equipment need to be observed. Protective clothing should be worn in designated areas of the company and under no circumstances used outside of those areas or at home, which increases contamination possibilities. Our boot wash stations are modular and variable so that they can be integrated into various hygiene station stands that we offer. 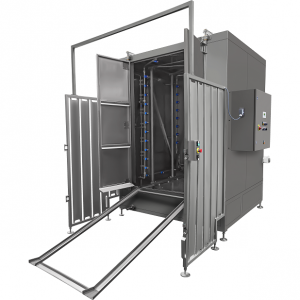 The boot wash stations can complement the measures that guarantee the prevention of contamination and multiplication of dangerous microorganisms. All measures and accompanying safety precautions must be precisely defined. Our experts stand at your service to help you devise production chains that are optimized fort he highest levels of hygiene and efficiency. An important factor for a sufficient hygiene is the hand washing, which together with the integrated boot wash stations, must guarantee that hands and booths should always be washed and disinfected if they have come into with contaminated objects. As a general rule for hygiene in the workplace we want to make sure that equipment used is made from stainless steel and in line with existing laws and standards. This also means preventing the consumption of food and drink at the workplace due to the risk of contamination with microorganisms or foreign bodies on glass or plastic. Smoking is also forbidden due to danger of pollutants and smell. In addition, any use of drugs or narcotics is banned due risk of contamination with active substances and employees can not bring any items for private storage to the workplace. All of these preventive measures, together with our high-quality hand wash stations, guarantee a spotless and regulated working process for highest productivity. Hand sanitizer stations at Nieros are made from stainless steel and can integrate desinfection products, soap and air dryers for smooth working processes. They are of utmost importance for ensuring hygienic behaviour in the workplace. Besides hand washing and disinfecting, any employee who suffers from illness or wounds poses a threat to safety. Therefore, it is essential to make sure that hand cleaning, boot disinfecting, as well as regular checks for any injuries or damages are performed. The first point of contact is always the direct supervisor who can decide whether a visit to the doctors’ is needed. Wounds can also be protected by temporarily moving employees, wearing special protective clothing (like masks for mouth protection, gloves or head caps) and by covering wounds. Generally, it is recommended to wear thongs or gloves to avoid slips and further contacts. Strict adherence to rules of conduct is a must, especially with open products – coughing, sneezing or even spitting out in the vicinity of the product is completely unhygienic. All our products are in line with existing rules and regulations, which we have thoroughly mastered during our extensive field work with clients from all over the world. If you are in doubt about an existing law, don’t hesitate and consult our experts, who will be happy to advise you. 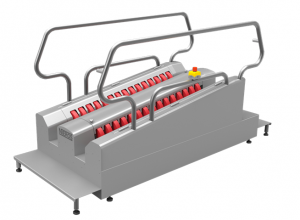 Nieros hygiene equipment is of the highest standards and adapted to modern industry needs. You will find complete descriptions with photos and technical details at our website. Our products and solutions are based on our long-standing tradition and best practices. We value your business and the company hygiene, which is the reason that we stay always alert and attentive to detect any potential contamination sources or leaks in your production. Our hand wash stations guarantee your employees constantly clean and disinfected hands. Do not hesitate to contact us for more information and a personalized offer. We will make sure to find the best possible customized solution for your situation. We remain at your disposal and look forward to hearing from you.